BROOKLYN – On Monday night, the strategy was to rush over an additional defender to stop any forward progress on the block, then spray back out into the lane and to the three-point line to deny passes and contest shots. The Thunder almost never likes to bring two defenders to the ball down low if possible, but against the Detroit Pistons, it was required. Wednesday against the Brooklyn Nets, a different game plan will be necessary. That’s no problem for this young-but-experienced Thunder roster, one that can run the floor and bang down low with the best of them. Whatever is required on a given night, it’s clear Head Coach Billy Donovan will get it from his team defensively. All season long, the Thunder has forced teams to work deep into the shot clock offensively creating desperation heaves or shot clock violations that have driven down shooting percentages and spiked turnover rates for the opposition. One thing that will ruin any defensive game plan, however, is allowing teams to not even have to take a contested shot at the rim, and instead get two wide open looks from the free throw line. Early in the year, the Thunder struggled with its foul rate. In the last 12 games the Thunder has allowed 20-or-fewer free throw attempts in 9 contests. The Nets are still a team in rebuilding mode, but it has some high-level talent in the backcourt, headlined by point guard D’Angelo Russell, who is averaging 23.2 Pts and 7.2 assists over his last five games, including a pair of 30-point outings. Even with Caris LeVert out and Joe Harris status up in the air, Brooklyn still has shooting on the wing in the form of Spencer Dinwiddie and Alan Crabbe, and a second unit with experienced players like Shabazz Napier, Jared Dudley, DeMarre Carroll and Ed Davis. While the reserves have been around the block, the starters are relatively youthful and energetic. The Thunder has gotta be ready for both. 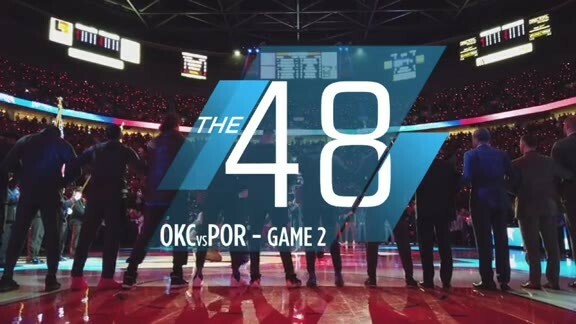 The Thunder can help its defense by generating high quality possessions on offense for all four quarters. Though it hasn’t shot the ball at an extremely efficient clip so far this season, the Thunder has been dominant in some core hustle departments that have allowed it to be productive offensively. Continuing to take advantage of second chance points, points off turnovers and points in the paint is crucial, but the Thunder also wants to emphasize getting to the free throw line itself, where last game against Detroit it shot 85 percent and against Atlanta it shot 93.3 percent. - Former Thunder forward Nick Collison stopped by practice on Tuesday in Manhattan and was seen chatting it up with his former teammates. The now fully-bearded Collison is a Thunder fan favorite, as he was amongst his on-court brothers as well. 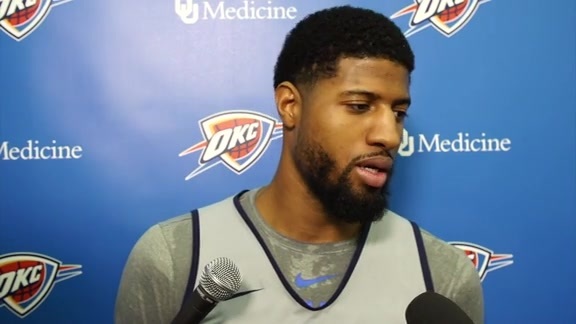 - Rookie guard Hamidou Diallo practiced fully with the Thunder on Tuesday as the team did some running, defense and scripting on both ends of the floor. He’ll continue to be evaluated leading up to the game against the Nets. - Second-year guard Terrance Ferguson returned to the Thunder lineup on Monday night, starting at shooting guard to make whole one of the most effective groups in the NBA. As a matter of fact, Ferguson is featured in three of the Thunder’s four best lineups that have played 20-or-more minutes together so far this season, including the starting group, which has a net rating of plus-24.3 points per 100 possessions. On Monday he chipped in 2 points, 3 rebounds, 1 block, 1 steal and impressively, 4 assists on smart drive and dish plays in the lane.